February, cold, cloudy, dreary… makes me understand why bears hibernate. They don’t like the month of February either. Kinda wish I could sleep through it too. Plus, they get to eat a ton before they go to sleep….that I wish I could do too. But since we are not bears, we must get through February. And try to enjoy ourselves because on the other side of this horrid month is spring…and spring, well who doesn’t love spring?!? 1…It is at least a shorter month. When they created the twelve month calander they some how knew that this month would be the most disliked. 3…Boxed chocolates. On sale. Post Valentine’s Day. Valentine’s Day itself…I don’t have an opinion about…I could take it or leave it. I do love the chocolate sales though! 4…Superbowl. Football, beer, parties, food…What is not to love. If only we didn’t have to work on Monday morning! 5…Febru-Cherry…It’s a hometown thing. It is awesome. 6…Spending too much money on out of season food (even though you know you shouldn’t) just so you can have a taste of summer. And that my friends is exactly what I did this week. My food of choice? My winter splurge? Basil. I needed not only the taste of summer in my kitchen, but the smell too. I am needy. With my basil I made pesto. Enough pesto to make this dish and then a little bit extra to freeze…to enjoy in a few weeks, if it lasts that long. Gnocchi are great little Italian Potato dumplings that are lovely little pillows of carb goodness. They are simple to make from scratch or can be found in the Italian section at any grocery…which is what I used here. Yep, I used store bought gnocchi and I have to say, Trader Joe’s whole wheat gnocchi are darn good. 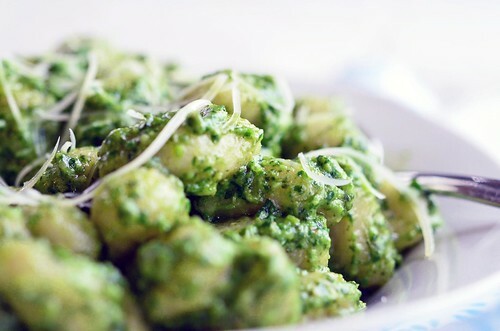 They stand up perfect to the pesto and the pesto coats the gnocchi like a dream. Match made in heaven if I say so myself. 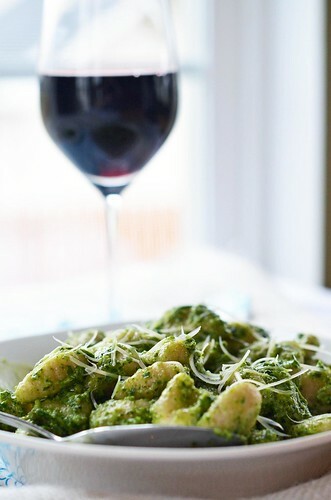 And the pesto…well I used a bit more parmasean cheese than normally called for, which melts when it hits the warm gnocchi…The garlic adds a bit of a punch….And the basil, well that just makes your house smell like summer…. Bring a large pot of water to a boil. Add about 1 teaspoon of salt to boiling water. While the water is coming to a boil, make your pesto. 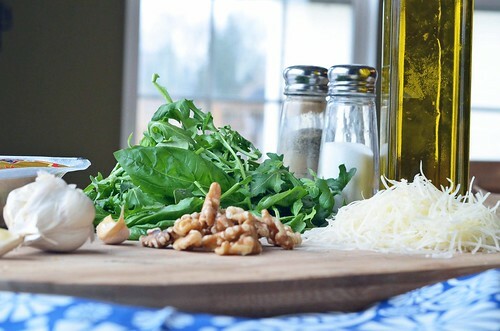 Combine basil, arugula, walnuts, Parmasean cheese, and garlic into a food processor. Process until smooth. With processor on, slowly drizzle in olive oil until you have a smooth and creamy pesto. Taste and then add salt and pepper to taste. Place about 1/2 of the pesto into the bottom of a serving dish. Set aside. 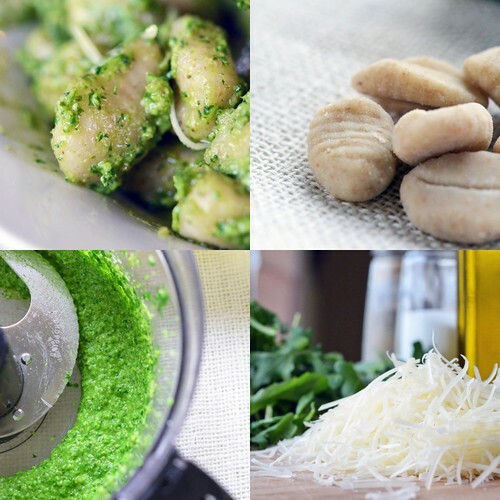 Once the pesto is made, prepare the gnocchi. Place the gnocchi into your pot of boiling water. Cook until the gnocchi begin to float – this will only take about 2-4 minutes, so don’t wander off! 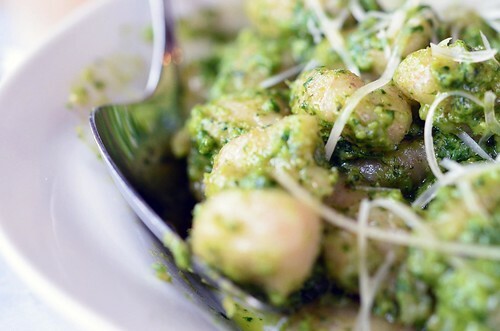 Once they are floating, drain the gnocchi and place in serving dish atop the pesto. Toss to coat the gnocchi with the pesto. P.S. the leftover pesto, store in a small plastic container and either store in the fridge for use within the next week or so or freeze for future use!